Dogtags 4 Jesus was founded by Clayton Winkler, a former GI whose life was transformed by the love of God and the inspiration he found in God’s promises in the bible. You can email Clayton at Clayton@Dogtags4Jesus.com. Video story that you can watch and share is coming soon! 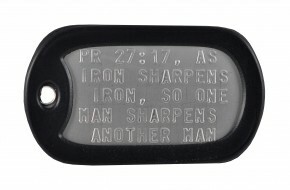 ©2014 Dog Tags 4 Jesus, LLC.